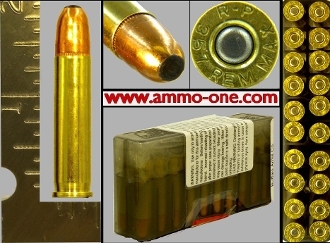 1 Box of 20 Cartridges: .351 Winchester Self-loading, aka .351 WSL, New, Custom loaded production by BACO using new 357 Remington Maximum brass cases, reducing the rim diameter, and forming them into 351 Brass cases. Then loading them with a 180 grain JSP (Jacketed Soft Point) projectiles. Loaded to SAAMI Specs. Please note, they still have the "R-P 357 REM MAX" head stamp, but they are 351 WSL cartridges, new and ready to shoot. History of the .351WSL: The Winchester Company introduced the 351 WSL in 1907 for the Model 1907 SL rifle. Please note, again: WSL = Winchester Self-Loading or Semi-Auto. The 351WSL was more powerful then the 35 WSL, which was not suitable for deer-sized game, and the rifle was discontinued in 1920; however, as with the other WSL cartridges, the 351 was produced until app. mid-1950s by the major ammuntion producers, Winchester, Remington, Federal. Today only made by smaller ammuntion makers. Consider obosolete, by the major manfacturers. Manufacturer: BACO, Buffalo Arms CO.